This Valentine’s Day I’m joining up with Donna and David Brown to share the #LoveToListen giveaway. We hope you’ll enjoy these five fun audio facts and will share your own recommended listens! In this haunting coming-of-age novel, award-winning author Terri Giuliano Long delves into every parents’ nightmare as a rebellious teenage daughter unravels before her family, forcing them to reevaluate the choices they’ve made…. 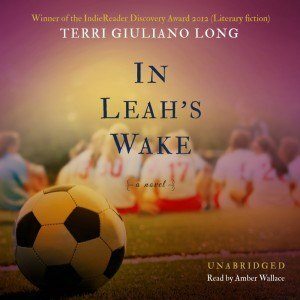 Star player and captain of her soccer team, sixteen-year-old Leah Tyler has a bright future ahead of her. Though she’s only in her junior year of high school, several colleges have already expressed interest in recruiting Leah–including Harvard, where her father desperately wants her to go. But when she meets bad boy Todd Corbett, her life soon spirals dangerously out of control. From ignoring her curfew to experimenting with drugs, Leah is breaking every rule. For the first time in her life, she feels like she’s the one in control, making her own decisions instead of following her parents’ dreams. But as Leah is about to discover, her actions have the power to forever fracture her family. Helen has waited for months for the heart that will save her life. After reaching out to the grieving mother of her donor heart, Helen realizes that a second chance comes at a price. The price, she soon realizes, is much steeper than she’d ever have chosen to pay. There’s more than one way to break a heart. There’s more than one way to destroy a life. History has known many famous cats – Garfield, Mr Bigglesworth, Simon’s Cat, the Aristocats, the Cheshire cat and the Keyboard Cat on YouTube. In recent years these feline things have replaced man’s best friend as the most popular pet in the U.S. while the Ancient Egyptians once worshipped them as gods. This was a mistake and I’m here to tell you why. 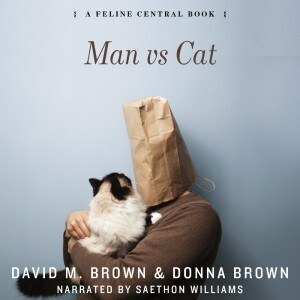 Man vs Cat is the story of one man, one woman and the six cats that changed their lives forever. To the woman they brought love and affection, to the man they brought sleepless nights, fear, paranoia and even ruined his jigsaw. Need I say more? Parental advisory: our cats cannot be relied upon to moderate their language. Sorry kids, this isn’t for you! I listen to audios when I’m exercising or commuting. I do listen to audiobooks in the car. It is an easy way to finish books in my busy life. I have not listened to an audio book before. I keep meaning to try it when I travel to my parents. I have never had the chance to listen to an audio book, but I would love to try! I haven’t listened to audiobooks, I’m a newbie. I have never listened to Audiobooks. I have not had a chance to listen, sorry about this.. I do hope to in the next few day though.. I don’t usually listen to audiobooks. I prefer reading and listening to podcasts. No I don’t listen to audiobooks, my GF does and she loves it. I haven’t really gotten into audiobooks, but I really should – I have a 30 minute drive to work, and could use that time to listen to a book. I hadn’t really thought about listening to an audiobook at the gym, but I see someone suggested that here and I might have to give that a try! i listen to them all the time. You ahve to listen to tina fey’s bossy pants. Yes I do listen to audiobooks,I love to listen to them while cleaning house,and it’s weird but my favorite time to listen to them is in the car when I’m driving since I have to be on the go a lot,I loved the Harry Potter books the most. I just started listening to audiobooks. I work out at the Y three times a week and It is fun to listen to a book while I am walking. Thank you! I have never listened to Audiobooks but I have heard great reviews! I don’t listen to audiobooks. My grandmother used to listen to audiobooks and my aunt listens to them. I started listening to my first audiobook a few days ago. It’s The Hunger Games, which I own a physical copy of, lol. I LOVE audiobooks on road trips… last time, I listened to John Waters read his own books. Funny!! I don’t listen to audio books. But I do love to listen to a good creepy pasta sometimes. I havne’t in a long time, but I’d love to listen to Andy Cohen’s books on audiotape! I have to confess, I have never listened to an audiobook before. I have always just read mostly because I can read much faster than someone can speak. I listen to audiobooks while travelling and sitting outside!! I’ve never listened audiobooks, I’d like to try! Not usually but it’s a great idea! I have only started listening to audio books. Kristin Hannah’s Home Front is a must read. I loved it. I’ve never listened to an audio book, but I would love to! no,I have never listened to audiobooks. I do listen to audio books whenever I can. As for recommendations, I’ll definitely have to think on that. Thanks! I don’t but other family members do. I haven’t listened to any audiobooks. No, I do not listen to audiobooks. I prefer to read books at my own pace. Thank you for the giveaway. I haven’t listened to one in a very long time but I would like to. I haven’t listened to audiobooks, I’ve always wanted to though. I like to listen to audiobooks over reading.I recommend the Michelle Knight story. Honestly, no, I’ve never listened to an audio book before. I love audio books of course my fav. is “Wicked”!!! I’ve never listened to audiobooks. I haven’t listened to audiobooks in years, but I think it is time to try them again. I haven’t in a long time and would love to restart. I usually listen to audiobooks regularly when exercising. I’m listening to “Watchers” right now. I’ve never listened to an audiobook. I listen to audiobooks sometimes. I mostly enjoy self-help kinds. I don’t listen to them – I would rather read them. But, I would be willing to give them ago. Thank you for having this giveaway and the chance to win. I have listened to audio stories yes. I have way too many faves to list. I used to listen to audiobooks years ago when I commuted to work. I listened to Tom Clancy books, not up to date with recent ones. 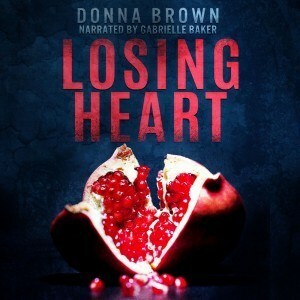 I don’t listen to audiobooks but would like to give it a try! 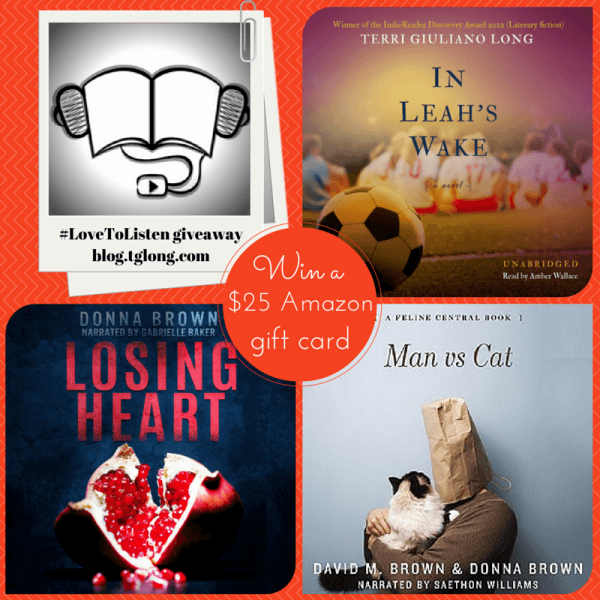 I haven’t listened to audiobooks, but I would like to start, and this giveaway. would help out dramatically.